Believers, isn’t this such a comforting verse, especially in today’s world! To know we are safe in the loving arms of our Lord day and night is so precious. To know that the Lord alone, He Himself, cares for us and gives us peace and keeps us safe while we sleep, and also during our awake time is such a blessing! 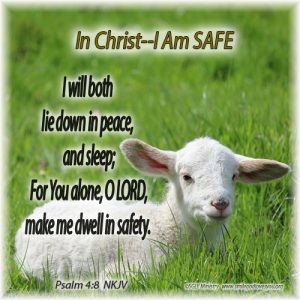 To know that He always makes us to dwell in safety is a benefit we should always be grateful for! How blessed a people we are! Let’s Praise God for who we are in Christ! Let’s give Him thanks and praise today, and tonight, for all He does for us whether we are awake or asleep. Let’s remember He is our Good Shepherd as it says in Psalm 23, He is with us and we are safe.